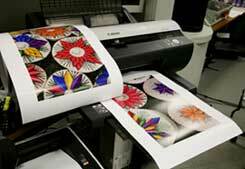 Canon imagePROGRAF iPF5000 is harbinger of a range of new Canon printers | Digital Photography. 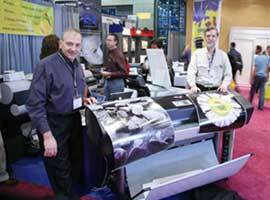 Canon imagePROGRAF iPF5000 large format compared with HP Designjet Z3200. 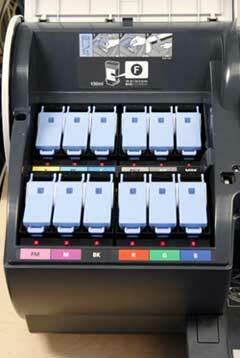 This innovative printer is not like the 11-color or 12-color ColorSpan DisplayMaker printers that we have at FLAAR. The 11-color ColorSpan uses, simultaneously, full quad-black + 7 additional individual colors. The 12-color ColorSpan version uses 12 different colors, simultaneously. With Epson, and Canon, you get one, or the other, but not full quad-black. So you get regular black or matte black: but these are not intended to function duo-tone blacks. Gray gives you duo-tone, but not three tones. If the place you are buying from claims 12-colors, that means they either don’t understand extended gamut printers or they are misleading you. So you see there are seven colors. So these ink combinations are for sophisticated users who feel able to get into printing at a higher level; the level that Epson has staked out, with the K3 ink in the Epson Stylus Pro 4800, 7800, and 9800. People know what to expect with an Epson printer. The question is that people are unsure about Canon printers because they are not what most fine art giclee ateliers use, or most digital photographers. We have a Canon EOS 5D camera, but since we don’t have any recent Canon printers, we continue to use our faithful HP 30 and HP 130 and our Epson printers. Price comparisons, ratings and evaluations will be forthcoming as this Canon imagePROGRAF iPF5000 becomes better known. In the meantime the Epson 3800 has come out. 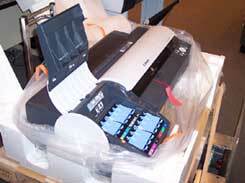 And now Epson is attempting to finish their Epson Stylus Pro 7900 and 9900 printers. There is a new FLAAR Report on these. 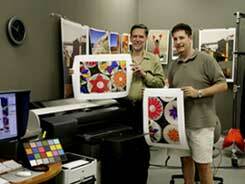 Canon imagePROGRAF iPF5000 printer at Fine Art Impressions, outside Charlotte, NC. Gary Kerr of Fine Art Impressions is working with Nicholas Hellmuth, FLAAR, to evaluate this printer compared with the several Epson printers that Kerr normally uses. We have the Canon iPF5000 under evaluation. Our university cut all budgets the month before it arrived, so without funding there was no staff to handle it. So we first sent it to Gary Kerr, Fine Art Impressions for a face-to-face comparison with an Epson 9800 and an Epson 9600. 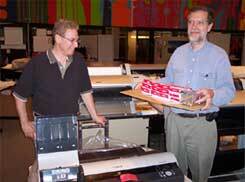 Gary Kerr is a long-time Epson user. He is a professional giclee atelier and also prints fine art photography. This is a kind of independent evaluation that is not widely available elsewhere. The Canon iPF 5000 is now being reviewed by Jim Trotter, one of the leading professional photographers of St Louis . 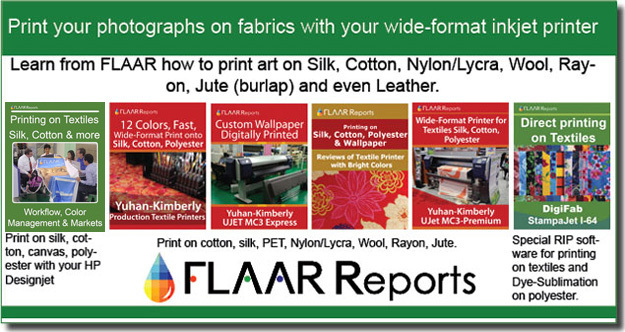 We want to insure that FLAAR Reports cover the full range of applications and that you get the documentation from diverse resources that are available to an international evaluation institute of the status of FLAAR. But the sheet-feeding mechanism on the Canon iPF 5000 did not work when Jim Trotter tried it, and 24" was too small for serious glicee or photo printing, so he abandoned the Canon iPF 5000 and bought a Canon iPF 9000. It will be interesting to get to know, and compare, the new 12-color HP DesignJet Z2100 and Z3100The details will be in new FLAAR Reports under preparation (since November 2006). We are also curious about the Canon imagePROGRAF iPF6000, IPF8000, and iPF 9000, but these have not appeared at PMA, were not at ISA, and there is no Canon booth listed for FESPA Digital (the largest international digital printing trade show in Europe ). However I did see the iPF9000 in Istanbul and then in Atlanta trade shows. 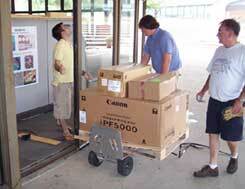 Canon imagePROGRAF iPF5000 arriving at FLAAR at BGSU for evaluation. 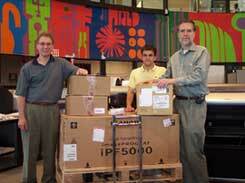 Here is the Canon iPF5000 being unpacked, with Professor Charles Spontelli and Professor Nicholas Hellmuth inspecting the new arrival. Considering that it is summer and that the printer arrived with no university budget line item, there were no funds available for the staff needed to do an entire evaluation. But we did an initial evaluation of the unit when it arrived. Separately and coincidentally, Spontelli and Hellmuth have co-authoring an article on Extended Gamut Inks for Giclee and Fine Art Photography that will focus on the highest saturated inks available. Although many places sell this Canon iPF 5000 inkjet printer, if you want to receive knowledgeable assistance in having your questions answered it is crucial to find a place that actually knows the entire giclee and fine art photo workflow. 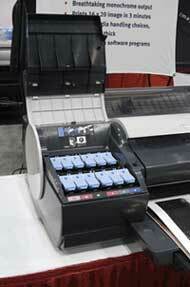 Here is a wider model Canon iPF printer in the booth of Parrot Digigraphic at PhotoPlus Expo in New York recently. 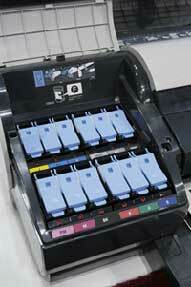 Their advantage is that they also offer Epson and the new HP Z2100 and HPZ3100 photo printers. So Parrot Digigraphic is not forced to push one brand and denigrate the other brands in the process. Their toll-free telephone number is 877 727-7682. Nicholas Hellmuth and FLAAR continue to keep their eyes and ears open relative to the Canon iPF5000 in general and also the Canon iPF8000 and iPF9000. The feedback is very consistent from all directions: a few issues with the printer itself, end-users continually report problems obtaining adequate information from distributors and resellers (lack of experience using the printer themselves because most resellers are copier dealers, not printer dealers). The other dealers also sell HP or Epson printers, and now that HP has also dedicated a billion dollars in research to develop the HP Designjet Z3100 series, dealers who offer both HP and Canon tend to favor HP, in part due to better tech support, more familiarity with wide-format printers in general from HP. The earlier problems of excessive dot pattern with the Canon iPF5000 is not quite as much of an issue now, but remains infamous in the memory banks of giclee, fine art photographers, and commercial photographers. The problem that has continued is the feeding issue: ours ground to a halt, but since it's under warranty it will be repaired or replaced. We have not yet issued a comprehensive formal evaluation for several reasons: first, we are still gathering documentation from other users; second, our building on the BGSU campus is being torn down, so we are doing all our evaluations either at our main offices in Guatemala, or at photo studios, photo labs, or giclee ateliers elsewhere, both around the US, in Europe, and here in Canada. Noel, Nicholas, and the helpful local dealer in Vancouver. Daily, sometimes hourly, people ask us, "should I buy the HP Z3100 or the Canon iPF5000, 8000, or 9000?" The User Groups and user forums are filled with conflicting information. In the future, when a new facility and fresh funding allow it, we feel that a full-scale FLAAR evaluation can resolve these hit-and-miss statements that are all over the Internet chat rooms. The Canon ads simply show smiling photographers with big names stating how fabulous the iPF printer is: nary a peep about their problems. Why did not one single Canon "Explorers of Light" mention the problems or issues with feeding on the Canon iPF5000? Why not? We assume that artists, photographers, and other print shop owners and operators are more sophisticated than falling for staged "Success Stories." This statement does not, in any way, mean the printer is bad, or even inadequate whatsoever. This is merely an observation that a meaningful evaluation has to be independent, honest, thorough, and realistic. Merely standing next to the iPF5000, 8000 or 9000, smiling, and saying that Mr Big Name Photographer likes PushyPuff Printer model #20,98720, is not helpful. Since Canon spent over one billion dollars designing their impressive new printheads, and has spent a fortune with their advertising the big names of Canon "Explorers of Light", it is getting time to have an actual review and a true evaluation, FLAAR-style. We are considering it, but have been on the lecture circuit in Korea, Rome, Dubai and consulting throughout Europe and Canada. 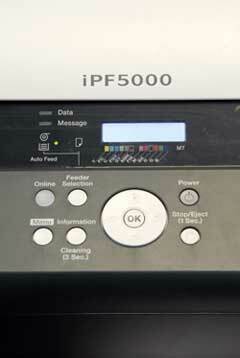 As soon as we have more information on the Canon iPF5000 and related printers we will update this page. 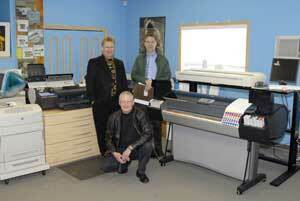 Just this week we were asked by a new franchise what giclee printer that they should buy. Their new franchise will ultimately buy many many giclee printers around the world, so we don't want to use pseudo Success Stories as the basis of the ultimate selection. In the meantime, one of the many many readers of this site, wrote to ask for help in deciding whether to select the HP Z3100 or the Canon iPF printers, so Nicholas went with him to visit a local printer dealer in Vancouver that happened to have both a Z-series and an iPF series in stock (this is where the reader, Noel Hodnett, was located). So this is Noel, Nicholas, and the helpful local dealer in Vancouver. Most recently updated December 15, 2008. First posted February 26, 2006. Updated Sept 25, 2006 and November 13, 2006.